The American people today are faced with a galaxy of problems centering around the difficulties resulting from the attempt of diverse racial and economic groups to live together under a singl;e government. The great majority of scholars agree that the roots of these problems go back through the web of American history into the colonial period. In addition to our domestic problems, we Americans must also wrestle with the problems resulting from our assumption of the position of leadership of the Western democracies. Many of the current world problems, like some of our domestic difficulties, are the outgrowth of what many writers are now terming the “freedom explosion.” A sizeable number of the new nations of the world are facing situations which have a distinct resemblance to those of eighteenth and nineteenth-century America. A knowledge of America’s past should prove, therefore, to be enlightening in studying the issues of today. Some people, perhaps, can see little correlation between the eighteenth century and our modern atomic age. Time has truly brought progress, and with that progress has come far-reaching changes in science, in technology, and in standards of living. Yet one thing does not change—the basic human nature. A brief glance at our history books or at the Bible indicates that the basic human nature of man has changed not at all since the days of Adam or Charlemagne. Our modern problems, like those of yesteryear, are wrapped up within the complexity of human and of group action; therefore, it should be rewarding to re-examine the American Revolutionary period and to take a deeper look into the lives of our founding fathers. Certainly, any study of Revolutionary America would not be compete without a penetrating analysis of the life of Patrick Henry, for this man was, in the words of John Adams, the man who would “. . . have glory with posterity of beginning and concluding this great revolution.” His position of leadership among the Revolutionary leaders and his penetrating insight into the direction of future Constitutional development certainly places him in a preferred position to students who wish to achieve a clear understanding of this era. The purpose of this chapter is to illustrate the extraordinary depth of Patrick Henry’s religious convictions, the wide range of Christian doctrines which had an influence upon him, and the manner in which this affected his philosophy of life and government. The extraordinary depth of Patrick Henry’s religious convictions is all but impossible to overestimate. Throughout his long and varied career, Henry’s guiding principle, in both his political and private life was his idea of what course action would best fulfill his Christian obligations. While still a young man, Henry said of the Bible, “This book is worth all of the books that ever were printed…” This view was to remain with him throughout the remainder of his life. To this man, the real test of an individual’s life. This was apparently the governing factor in any decision Henry made. 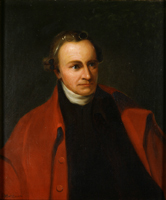 Although he spent most of his life in public office, Patrick Henry stated, “…I think religion of infinitely higher importance than politics,” and he continued, in speaking of his Christian reputation in comparison to his political reputation, “…This is a character I prize far above all this world has or can boast.” A quick glance at Henry’s life will show that this was no spurious statement. We cannot see the reason of these dispensations now, but we may be assured they are directed by wisdom and mercy. This is one of the occasions that calls your and my attention back to the many precious lessons of piety given us by our honored parents, whose lives were indeed a constant lesson and worthy of imitation. This is one of the trying scenes, in which the Christian is eminently superior to all others and finds a refuge that no misfortunes can take away…Perhaps I may never see you in this world—oh, may we meet in that heaven to which the merits of Jesus will carry those who love and serve him. In writing to his daughter shortly before her marriage, Henry advised her to study outstanding sermons of the day because “a woman devoid of rational ideas of religion, has no security for her virtues; it is sacrificed to her passions, whose voice, not that of God, is her only governing principle.” Nothing in his family correspondence indicated that religion was anything less than of primary concern. There are many illustrations of Henry’s devotion to the Christian life in his public as well as in his private career. Morgan insists that no public record can be found of an instance wherein Henry cursed of swore. This biographer also asserts that Henry, who did not have a reputation for liberality in financial matters, paid for the printing of and circulated at his own expense copies of Butler’s Analogy of Christianity and Soame Jenyn’s Internal Evidences of Christ. The first lawsuit which Henry argued before the House of Burgesses was, fittingly enough, an attempt to unseat a representative who had allegedly exerted undue influence upon the electorate by expenditure of enormous sums on campaign liquors. Additional evidence of Patrick Henry’s Christian steadfastness was indicated by the fact that almost all of his speeches demonstrated the overwhelming influence of a vigorous Christian spirit. Allusions to the Scriptures abounded throughout. In speaking, for example, of the tendency of the aristocracy to retain a sentimental attachment for the British, he declared, “The flesh pots of Egypt are still savory to degenerate palates.” On many occasions during the Revolutionary War, he reminded the hard-pressed Virginia militia that they should pray for divine intervention and that “…the same God whose power divided the Red Sea for the deliverance of Israel, still reigned in all of his glory, unchanged and unchangeable…” In scarcely a single one of his public speeches, did Patrick Henry fail to reaffirm his faith in an omnipotent and ever-accessible God. At the Constitutional Ratification Convention of Virginia in Richmond, he stated, “I see beings of a higher order anxious concerning our decision!” In the great bulk of his speeches to the common people, Henry was ever prodding—ever goading—the deep faith that lay beneath the breast of the American Frontiersman. This evidently was the way in which to strike a responsive chord in the masses of colonial America; for it was the masses, not the aristocracy, who made Patrick Henry the leader of colonial Virginia. Henry was, undoubtedly, able to move this spirit so well and to utilize its effectiveness in stirring the people to action because he shared the overpowering frontier faith in an ever-watchful God who led, guided, and protected His people. Often bitter differences of opinions occur among equally devout Christians as to just what course of action God has outlined for a nation or for a people. In determining with any precision the religious viewpoint of a person and in understanding that person’s personal religious philosophy, one would find helpful and understanding of the influence which various divergent doctrines have had on the individual. To be true and just in all my dealings. To bear no malice nor hatred in my heart. To keep my hands from plucking and stealing; not to covet other men’s goods, but to learn and labor truly to get my own living in that state of life into which it shall please God to call me. Although Henry became a firm opponent of the establishment of the Church in Virginia, the fact he remained a member demonstrates that he must have shared many of its beliefs, at least in regard to his own personal life. A man of Patrick Henry’s religious fervor would certainly not have remained in a church with which he could find no common ground. Despite the fact that he remained an Episcopalian, Patrick Henry was even more greatly influenced by the frontier democracy and the Calvinistic doctrines of the Presbyterian Church. On many occasions, Henry demonstrated the spirit of the Calvinist in his own intimately personal life and certainly in his idea of the way a Christian should conduct himself in political service. This Presbyterian influence, undoubtedly, came to Patrick Henry through his mother. Meade cites evidence to the effect that she viewed Patrick’s religious training as a serious matter. Another biographer produced a letter of a contemporary of Mrs. Henry, who stated, “Never did I know a Christian character equal to hers.” While Patrick Henry was still a boy, Mrs. Henry became a devout member of the Presbyterian Church, as did her father. Every Sunday Mrs. Henry and Patrick attended the Presbyterian Church in a double gig, and on their return from the services she would make him give the text and a summary of the sermon. The influence of this early Presbyterian training upon Henry is clear and unmistakable, particularly in his political life. He, on many occasions, voice his deep respect for the Presbyterian Church and his admiration of the oratorical ability of several of the Presbyterian divines who were spreading their ideal of Calvinism throughout the Virginia back country. Nor was this the end of Henry’s contacts among the various church denominations. In his letters, he expressed great admiration for various Methodist pastors who were conducting revivals in Louisa County during his youth, and he was apparently always on good terms with various Quaker leaders. Many Quakers lived in Louisa County during Henry’s boyhood. Doubtlessly he had many opportunities for contact with them, for despite their pacifist sentiments, the Quaker leaders in Philadelphia greeted Patrick Henry’s appearance as the First Continental Congress with great enthusiasm. The wide range of doctrinal influences upon Henry in his early years partly explains the depth of his religious convictions. They left an unmistakable imprint upon him and produced a unique blend of liberality in some phases of his philosophy and, at the same time an amazing firmness and tenacity in certain of his viewpoints concerning the duty of the Christian. Tyler states that “there is much contemporaneous evidence to show that Patrick Henry was throughout life a deeply religious person…” He was “…a steady reader of the English Bible; the diction of which is stamped upon his style…” of oratory. Meade relates an instance wherein a stranger mistook Henry for a country parson. All of Henry’s biographers point up the great extent of Henry’s religious feeling; yet, they do not seem to place any importance upon this factor in clearing up some of the seeming inconsistencies in his political career. The biographer who is familiar with the extent of this devotion of Patrick Henry to his Christian principles can readily see wherein Henry in many cases was often placing his Christian duty above his ideas of the proper functions of government. If one keeps this face in mind, that Henry’s first allegiance was to his god, many otherwise puzzling actions become more easily explainable.